In June 2017, construction started on a new, larger GO Bus Terminal that will provide you with more efficient service and improved access to downtown amenities and transit. 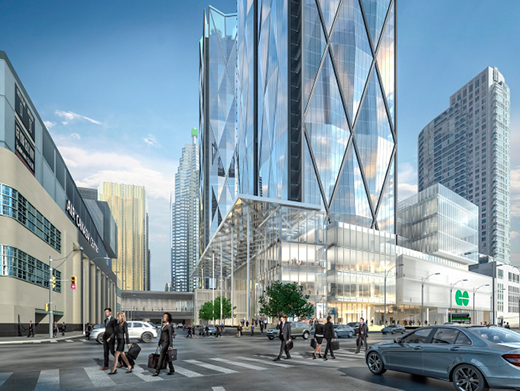 The new terminal will be built at 81 Bay Street—an area south of the rail corridor that was formerly a parking lot—and is part of Ivanhoé Cambridge and Hines’ larger commercial development. This location provides better access to the Gardiner Expressway and Lake Shore Boulevard, making it easier for you to get to your destinations. The new bus terminal will better connect you to GO Transit, the TTC, VIA Rail, UP Express, and the proposed future high-speed rail connection to destinations in southern Ontario. This page will continually be updated with details about the new station, renderings, and status updates. It’s just one of the ways we’re keeping you in the know about construction at Union Station. To receive timely, customized information about service changes and other GO news, please sign up for On the GO alerts.